No more pork chops and apple sauce. Nope. Not anymore. 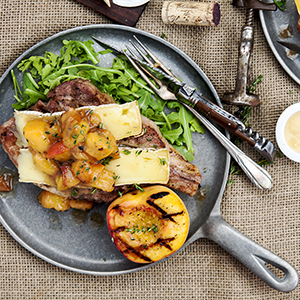 Instead, let’s make some beautifully grilled pork chops with peaches… and some brie, mustard and other goodies. You’ll find this recipe is loaded up with rich, balanced flavors that will make your mouth water and impress all your guests. The best part is just how simple it all is. Let’s take a look at how to make this meal. You’re going to love the flavor combination of the brie, mustard, peach compote and pork chop. So balanced and delightful. Grilled Pork Chops with Peaches… and more. The first time I had grilled pork chops with peaches was at a small restaurant (no longer open) in Chagrin Falls, where I grew up. It has to have been over 15 years now since that meal, and I can remember every detail perfectly. I love how some meals really make an indelible impression. Years later, I took the same idea and made a sandwich out of it at the catering company. It was only on special occasions and we always sold out. Layers of shaved ham with brie and a delightful peach chutney all served on fresh made crusty bread. Just delightful. This recipe is chock full of history and flavor. If you have the time, try to salt and pepper the chops before you leave the house in the morning. Then let them come up to room temperature for about an hour before grilling to maximize the tender juiciness of the chop. Find a good, strong brie. 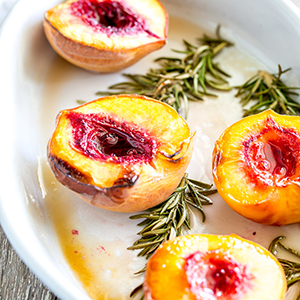 It will work perfectly with the peaches and balances really well with the dijon mustard. How do you know if the brie is strong? Put the package up to your nose when you are at the store. If it smells like nothing, it will taste the same. Find one that has a light, pungent aroma and buy it. The bright and bold flavor from the peach compote cuts through the creamy brie and unctuous grilled pork chop. Season the pork well in advance. The salt will help to ensure the chop stays juicy. Bring the chops to room temperature before grilling, particularly if they are thick cut. Put the brie in the freezer for 30 minutes before slicing. You’ll find that it is really easy to slice long, even strips when partially frozen. You can make the peach compote three or four days in advance. Just store it in a sealed container in the refrigerator and reheat gently on the stove. Always serve this meal with a good Dijon mustard. Just like with the Dude’s rug, it will really bring the meal together. 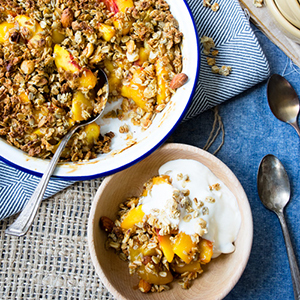 Looking for some other awesome peach recipes? Not all are low carb- but they sure do look fantastic!! This recipe is simply mouthwatering. 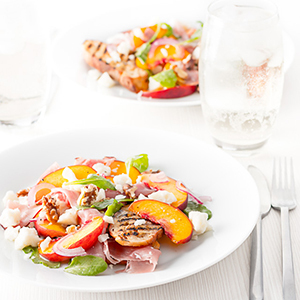 When the flavor of the grilled peaches is combined with sharp mustard, creamy brie and unctuous pork chops it creates a symphony of delight. Season the pork chops with the salt and pepper as far in advance of cooking (up to 1 day) as possible. Keep refrigerated until 1 hour before cooking. Remove from the fridge and allow to come to room temp. Heat the grill. We are going to want direct, high heat. While the grill is heating, split the peaches in half and remove the pit. Coat the cut side of the peaches with the olive oil. Add a pinch of salt and pepper. Grill the peaches, cut side down, for 10 minutes or until cooked through. (Alternatively, follow the directions for the Peach Compote found in the recipe notes). Remove the peaches from the grill and allow to cool. Dice when cool enough to handle. Cover and set aside. Clean any peach residue from the grill. Place the chops on the grill. Cook the chops for 2 minutes, then rotate 90 degrees. After the chops have cooked for about 4 minutes, flip and repeat the previous process. Add the sliced brie to the chops while they finish cooking. Remove the hot chops from the grill. Smother with the peaches and serve with a side of Dijon mustard. 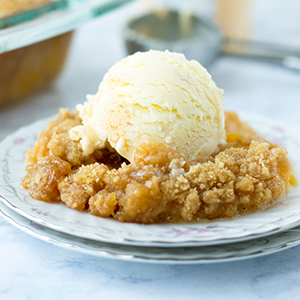 You can make this recipe either with or without the Peach Compote. If you make the peach compote, then please don't grill another 3 peaches for this recipe (you'll have way too many peaches!). The compote is so simple and delightful that you should give it a try. It's low carb, refined sugar free and really packs a flavor punch. As you can see from the pictures, I made the recipe both ways: with the compote and also with just the peaches. They are both really good and have similar flavors. The cook times in this recipe are based on a bone-in, 1" thick pork chop. They are also based on my grill, which gets pretty hot. You will want to cook your pork to a minimum internal temperature of 145F. I don’t usually go for my pudding with my dinner – (ie. meat and fruit), but this sounds so good that I am going to have to try it. I have to tell you it’s absolutely delicious and unique! You simply have to try it to see for yourself. Don’t forget to let me know how it went.